Isn't the above fabric absolutely gorgeous? I picked it up yesterday at Joann Fabrics for only $10 a yard! I couldn't believe it when the woman rang me up. I was expecting to pay $20 a yard and it was on sale for half off. She said that the sale would be going on until tomorrow so I should come back to get more of the designer fabrics. Go check out your nearest Joann Fabrics! I saw a bunch of other fabrics that I was coo'ing over but just had to leave since I'm trying to watch how much I spend (foreign concept to me but I have to try, right?). You're probably wondering what I'm going to do with the above fabric. I came across this awesome blog yesterday, Effortless Style, which had a GREAT DIY project - a DIY rug! This was a major find since I've been wanting a rug for my office, but haven't really found anything (in my price range) that I really like. So, the moment I read the post I decided that I would try my hand at it asap, which is why I headed over to Joann Fabrics. I haven't started it just yet since I need a sewing machine (which I don't have, hint hint mom or tran mom). I'll do a post on the creation of the rug as soon as I can. 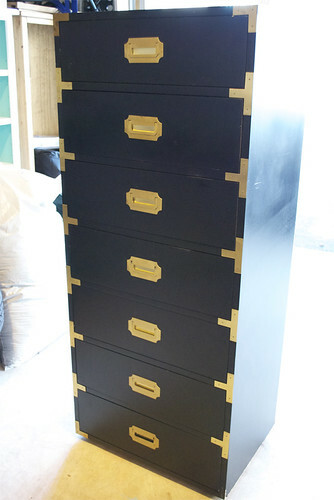 Now, pictured below is a fab Craigslist find that I acquired over the holidays: a gorgeous black & gold Hollywood Regency style dresser (only $70!!). 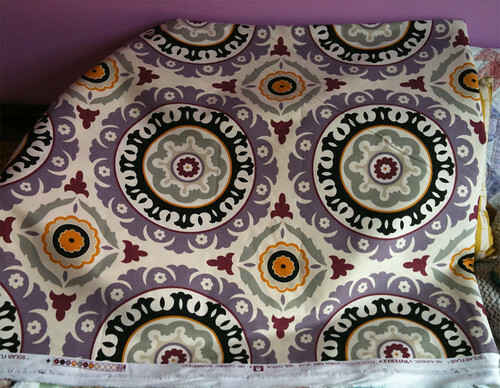 I purchased it with the intent to transform one of my parents' bedrooms into a glamorous guest room. I say 'intent', because I haven't had time to work on it yet. But now that I do have some time, I am on a mission to glamorize the unglamorous bedroom. 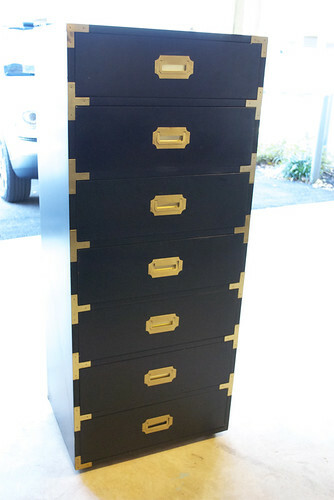 I just had to share this chic and unique dresser with you. I'll make sure to keep you posted on how the guest room is going. It'll be one of my larger projects so I am super excited. Stay tuned for more on it!